Looking for a comic style zombie shooter for the iPhone? The never ending number of zombie themed iPhone games keep emerging in the App Store, and Zombie Area! by Rapid Turtle games is a new release in this saturated genre. This review will cover the application’s unique features and compare it with the countless other zombie games available. Overall we found Zombie Area to be a moderately strong released with a few redeeming features worth mentioning. If you particularly love zombie games and can’t get enough of them Zombie Area is an app worth looking into. Specifically, the unique control scheme in the game do a great job of utilizing the touch screen capabilities of the iPhone and iPod Touch. Players assume the role of a rock star who has somehow managed to survive a worldwide disaster that has turned most of the world’s population into mindless zombies. Armed with only a shotgun, players must blast their way through several levels that are full of these brain-craving monsters. The controls in Zombie Area! are definitely this title’s strongest point. Because the game features sure intuitive controls, players should be able to pick up the title and instantly understand what it is they need to do in order to start slaying hordes of undead bad guys. You simply need to tap the edge of the screen to move in whichever direction you desire or tap on the enemy you wish to fire at. 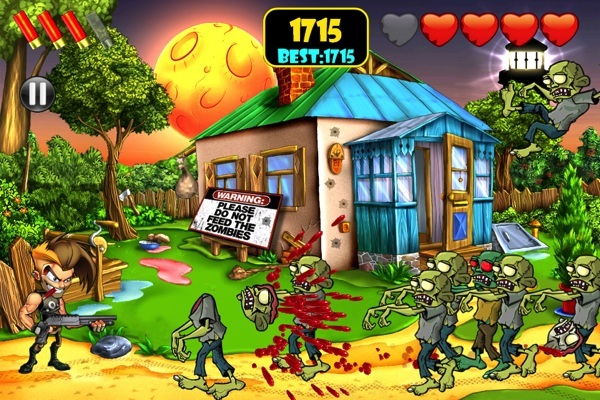 The graphics in Zombie Area are very well done and use stylized cartoon characters. The comic feel is fun and adds to the overall experience. Worth mentioning is that this iPhone game does feature quite a bit of blood and gore, so this is definitely not a suitable title for young children or anyone who is put off by the sight of copious amounts of graphic violence. For those who aren’t squeemish, the flying body parts add a great deal of fun to the app and make killing zombies incredibly enjoyable. The game’s best features are its simplicity and accessibility. The biggest complaint that can be leveraged against Zombie Area is that the gameplay is almost the same from start to finish. There are no additional weapons to collect or upgrades to purchase. Even though the game is initially very fun, fighting monsters with the same weapon for during an entire game quickly becomes very tedious. The gameplay in each stage is almost exactly the same; the only thing that changes from stage to stage is the background. Overall, although Zombie Area! is fun for gore lovers and can be for spurts at a time. It has some work to do before it can set itself apart from other zombie titles in a the competitive App Store market. 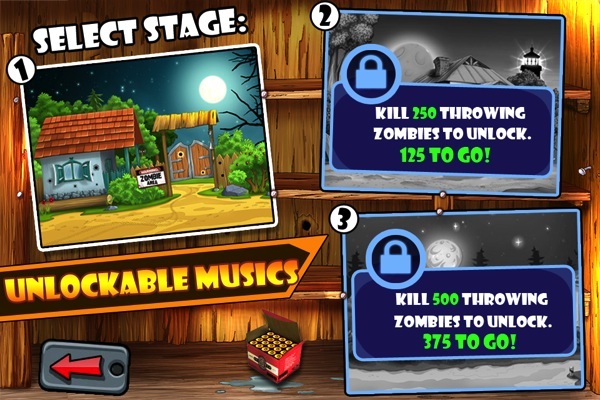 AppSafari review of Zombie Area! was written by Joe Seifi on March 26th, 2012 and categorized under Action, App Store, Arcade, Fun, Games, iPad apps, Universal. Page viewed 4166 times, 2 so far today. Need help on using these apps? Please read the Help Page.